With a tale creepy enough to attract most kids and sweet enough to keep them watching, Monster House turns out to be surprisingly clever. Monster House gets off to a creepy start — as in deeply, darkly creepy. There’s this ugly old house cared for by a skinny, ugly old man named Nebbercracker (Steve Buscemi, Big Fish). 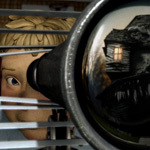 Directly across the street, DJ (Mitchel Musso, Secondhand Lions) spies on the rickety ol’ psycho house through his telescope, keeping an eye on Nebbercracker and his nasty shenanigans. One fateful afternoon, when DJ is playing hoops with his chubby, dorky buddy named Chowder (Sam Lerner, Envy), of all things, their basketball winds up on Nebbercracker’s lawn. Their adventures in getting the ball back lead to Nebbercracker having a heart attack. Oddly, mysteriously, in Nebbercracker’s absence his house’s chimney still blows a steady stream of smoke and the boys seek to unlock its deep, dark secrets. Along the way, they meet a girl named Jenny (Spencer Locke, Spanglish). She’s one sharp chick, a prep school girl, a Type A salesgirl going door to door selling candy on Halloween. Her sales pitch is that by making sure each house has candy for the night, they can prevent egging, TP’ing, and other “tricks” for their lack of treats. It’s immediately apparent this little girl is destined to get her own TV show and ultimately be the subject of financial scandals and lawsuits. Monster House was filmed using the same motion capture process as The Polar Express and it’s a nifty piece of eye candy that at times actually looks more like a Tim Burton stop-motion feature than a computer-animated flick. It’s an animation technique that is used to great effect and it’s perfectly suited for the clever antics first-time director Gil Kenan has up his sleeves. One particularly sharp and witty sequence involves the kids’ plan to infiltrate the monster house using a vacuum cleaner disguised as a boy. The dummy is loaded with bottles of cold medicine and, after it gets “eaten” by the house, according to the plan, the house will fall asleep. Unfortunately, their charming little plan gets interrupted by a pair of low-rent cops led by Officer Landers (Kevin James, TV’s The King of Queens). The cops want the kids to leave Nebbercracker alone or be shipped off to Sing Sing. Complementing the film’s persistent cleverness is a goofy, pitch-perfect — and sometimes gross — sense of humor that any early teen should be able to appreciate. But the movie does have a definite edge to it that might be too scary for the wee ones. The underlying story involves a young — and still skinny — Nebbercracker marrying a fat lady, Constance, from a freak show (voiced by none other than Kathleen Turner, Romancing the Stone). The kids stumble on Constance’s grisly grave in the basement of Nebbercracker’s house and the boys quickly deduce a horrible story of what transpired there. They think Nebbercracker fattened her up and ate her. Unfortunately for them, the truth is more bizarre. Monster House takes place around Halloween, but it’s not clear which year. The kids’ houses feature tape decks and old video game systems; there are no cell phones and it’s clearly a low-tech world. That little detail also serves the movie well. At the movie’s start, DJ argues with Chowder that they’re too old to go trick or treating. But, happily, the kids go on their big adventure across the street, stumble on a touching love story between Constance and Nebbercracker, help the old man (back from the hospital) reclaim his life, and then… they’re left to being kids again. And they do go trick or treating. It looks like Monster House is one of those movies that was kicked around Hollywood for quite a while. I didn't confirm an exact start date, but according to ShowBizData.com, "Initally had a May '99 start date was then pushed and put on Hold as of Jan. 2000. Kenan revived in '03. Sony picked up out of turnaround from DreamWorks." In digging around a little further, it looks like the actors were filmed way back in September/October 2004 for the motion-capture portion of the production, then the animation process took over.